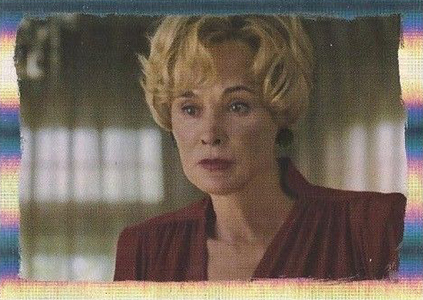 Something scary comes this way with 2014 Breygent American Horror Story trading cards. Capturing the cable show's first season, the set includes a wide variety of inserts and hits. 2014 Breygent American Horror Story has a 72-card base set. A total of 59 cards recap the first story arc's 12 episodes. There is also a 12-card subset called In the Basement and a checklist. The season has a self-contained story that revolves around a family moving to Los Angeles from Boston where they find their new house is haunted. Each box of 2014 Breygent American Horror Story has eight parallels. These come in five different levels. The rarest are numbered to 50 and 10. Autographs and costume cards lead the chase. Each box has a total of three hits. Much of the main cast has signed for the set, including Dylan McDermott, Connie Britton, and Taissa Farmiga. There is also a limited number of dual autographs. These use stickers to offer different signature combinations. 2014 Breygent American Horror Story also as three basic insert sets. Creepiest Moments, Puzzle and Quotes each have nine cards and are inserted 1:12 packs. Sketch Cards are also in the product, but they're extremely rare. It's estimated there are approximately 200 total for the entire production run. 23 cards. SPR1 available via redemption. ZQR1 distributed as a 3-case incentive and not in packs. Click here for a full guide and gallery. 34 cards. Short prints noted with print runs confirmed by Breygent. The following is a list of artists who contributed to the set. Breygent has stated that there are approximately 200 total across the entire product run. Good: Comprehensive checklist, more dual costume cards than single swatch, simple design. Bad: No Jessica Lange autograph, not a lot of variety in costumes used. The Bottom Line: I’ll be up front — I’ve yet to watch an episode of American Horror Story. That said, this is still a great set. It has several autographs that I still recognize from other places. The content has lots of great visuals. There is lots going on, but it doesn’t feel overwhelming. Overall, this is a very balanced product and the fact that I enjoyed it despite not knowing a lot about the show is a testament to its strengths. The base set couldn’t be much simpler. Fronts have a full-bleed shot from the show, no captions. Backs are loaded with text and some subtle design elements. Normally I like some sort of text on the front, but the visuals are so good on many of the cards that the lack of borders and caption make sure they’re not impeded. Parallels do add borders, but they’re thin and don’t wreck anything. They also use a less glossy card stock that adds some nice texture. I do wish the other basic inserts used something more than foil board. One set is fine, but all three makes the overall impact a little bland. I’m also not usually a fan of puzzle inserts unless they take a collage approach where each individual card stands on its own. 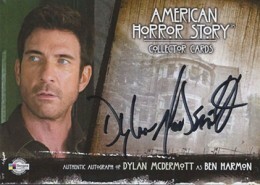 I’m sure Dylan McDermott is proud of his chest, but I don’t need a card dedicated to it. The busiest cards in the product are the autographs. They have an actor image, a caption, a couple of logos, and a washed out background image that serves as the spot for the signature. It’s not my favorite design, but it does do a good job of highlighting the autograph. Costume cards take a similar approach but the added texture the memorabilia brings adds a lot to it. The die-cut window is also a nice touch over the standard circle or square. Comprehensive is the first thing that comes to mind when I think of the checklist. Outside of Jessica Lange’s autograph, there’s not much that’s missing. The autograph list covers most of the first season’s regulars, many of whom have appeal to people like me who don’t watch the show. It’s also impressive that the majority of the Costume cards are dual-swatch cards. Sure, there isn’t much variety in the number of costumes used or characters, but Breygent did a good job of keeping the chase interesting. The price tag for 2014 Breygent American Horror Story is extremely reasonable given what you get. The three hits are solid. Toss in the guarantee of a base set, some tougher parallels and the small chance of hitting a sketch card or dual autograph and you’ve got a product that’s very fair. Heading in, I didn’t know much about American Horror Story. I still don’t know a ton but I’m intrigued. That’s a sign of a good set. There’s a lot going on, but, at the same time, it’s not overwhelming like some other products. Visually, the set’s intriguing. And there’s lots of content that can appeal to a broader audience beyond the show’s core fans. I’m really excited about these, and I don’t collect many cards anymore. This is the one show on TV that I DO NOT miss, no matter what. Even when traveling for work, if the hotel doesn’t have FX, I stay elsewhere. I hope they really limit the production. It looks like you’re guaranteed a base set per box. Let’s have one-per-pack inserts of the three (3) nine card insert sets mentioned in Previews. That would be 24/27 inserts for special sets and puts you at a 2 box break. I’d love to see Autographs and relics at 1 per box. And go deep. Lots of talent in the show (snag them all if you can) so each is very limited (numbered <25 for all). Limit Lange as she should appear in each release if future series are put out. I hope they do "something special" with the Black Dallia for this series. There is something hinted in Previews that might suggest that. Something "ghostly" and very cool. Artifacts from actual crime scenes or from a real-life haunted house would rock. Of course, I marked out for the balloon boy relic in last year's Allen and Ginters (which is fake, but neat). If they did series 2, based on Asylum, you'd have the same opportunity with Anne Franke type stuff as you did Dahlia. Fantasy writing, for sure, but could be done AWESOME. 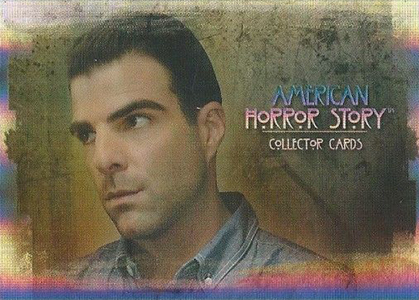 When are American Horror Story trading cards for sale, and what is the cost per box? Liebra Loy � The current target is July. I’d expect them to be around $75 per box. Not going to invest in this if there’s no chance for a Lange auto. This company’s website has some images of the cards and it looks like the cards are from Season 1 which was quite awhile ago.